Open Unity to create a new project. Select 3D. 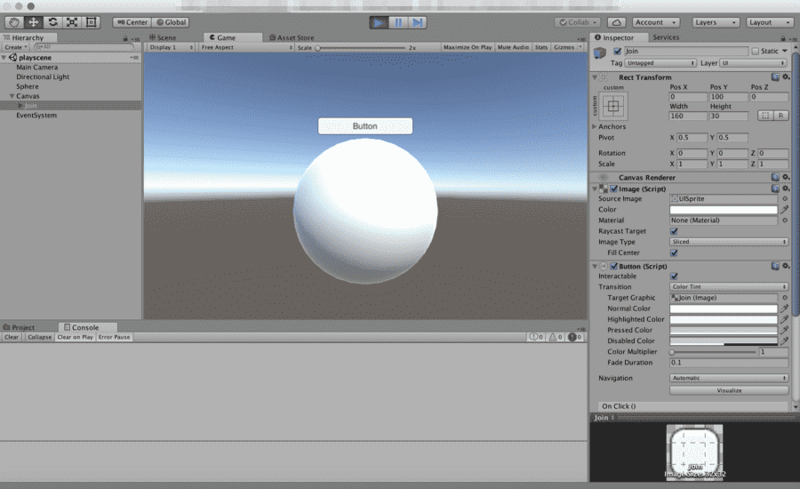 Add Game Object: Sphere and one Buttonin the default scene. Save the scene to Assets/playscene.unity. 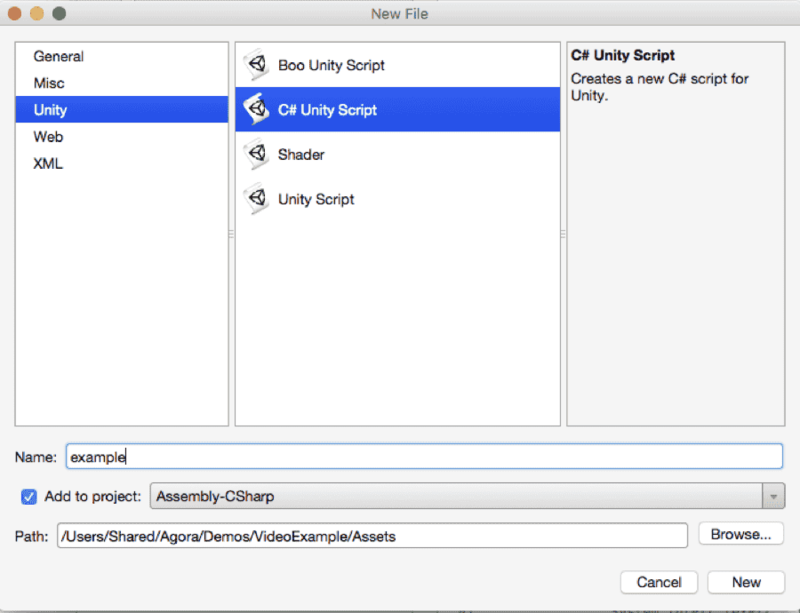 For information on how to use the Unity, refer to the offical Unity documentation. 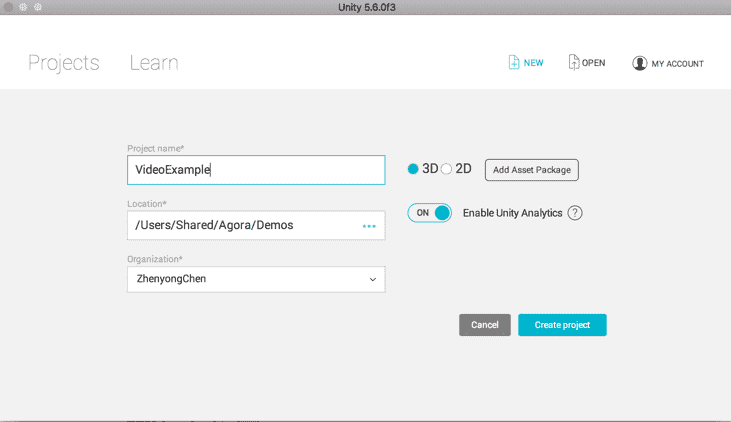 Copy the libs/agora-rtc-sdk.jar file in the SDK to Assets/Plugins/Android/AgoraRtcEngineKit.plugin/libs path of your project. Copy the Assets/Plugins/Android/AgoraRtcEngineKit.plugin/AndroidManifest.xml file from the Sample in the SDK to the Assets/Plugins/Android/AgoraRtcEngineKit.plugin directory of your project. Copy the armeabi-v7a and x86 files in libs/Android of the SDK to the Assets/Plugins/Android/AgoraRtcEngineKit.plugin/libs path of your project. Click Join and select example.cs. Select File> Build Settings…, and the Build Settings dialog box pops up. Open playscene and click Add Open Scenes to load the playscene to the build. Click Build to build the app. To demonstrate the video for gaming functions, you will need two or more Android devices. Click Join on both devices to join a channel. If the App ID is set correctly. If the network is in good condition. If the permissions of network and camera are authorized.